I have made a lot of brownies. I have made brownies with chocolate chips, with marshmallows, with candy and Reese's, and sometimes, with nothing added at all. But I have never made a brownie as delicious as these. 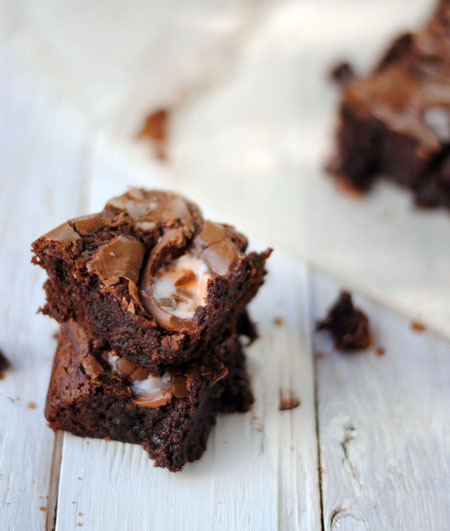 Ooey, gooey, and fudgey brownies with a surprise topping of Cadbury Creme Eggs to help you get in the Easter spirit. A little less twee than bunnies and eggs slathered in pastel. And that's just the way we like it around here. PS... Get more Easter baking ideas by joining me on the Leanne Bakes Facebook Page and by following me on Twitter! Heat butter and the chocolate chips in a saucepan over low heat, stirring often to avoid burning. Once the chips are melted, cool the mix to room temperature in a tub of cool water. Gradually add the flour to the egg mixture, until blended. Then stir in the cooled chocolate and mix thoroughly. Pour batter into a greased 9x11-inch pan and spread evenly, then bake for about 15 minutes. 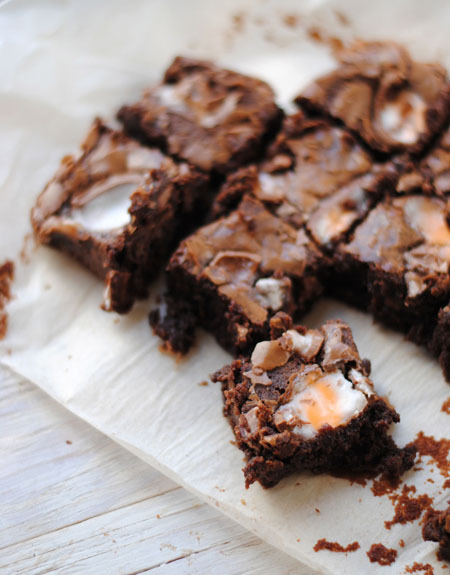 Remove from oven and chop the creme eggs into 4 pieces, then place evenly over the half-baked brownies. Return to oven and bake for an additional 15-18 minutes. The brownies are done when moist crumbs stick to a toothpick inserted in the centre.